Have you ever imagined using you mobile phone like a real time desktop ?? It does sound different, however a recent announcement from Canonical Inc, the makers of Ubuntu, gives signs of a mobile desktop. With this technology canonical has pushed the desktop experience to a new limit. The technology is based on Android devices preferably with a Dual Core Processor having at least a Gigahertz or more processing power. 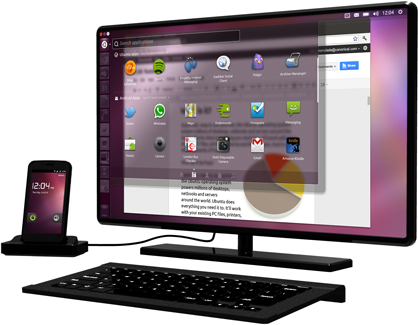 Once Ubuntu for Android is installed on your phone, the phone can be connected to a monitor (through an HDMI port? ), a keyboard and mouse (Bluetooth?) and you can boot into Ubuntu for Android. This will simultaneously load the Ubuntu operating system and you can operate it with the keyboard and mouse, monitor serves as the display for your OS. This OS integrates with your Android phone so well, that you can make or answer calls on your phone, or use any of phone’s features while operating the Ubuntu system. Canonical is mainly targeting this technology for Enterprise customers. As the operating system offered is a complete desktop OS, almost all the productivity software can be installed. Cloud based services wil be another best resource for devices working on such technologies considering the performance offered. Canonical has also released minimum hardware configuration required for this technology to work on the Android phone. Also, there is list of few application which will come with the OS like the Chromium web browser, Google Calendar, Thunderbird email client, Gwibber, VLC Player, Android dialer, etc. Currently this technology is evolving. This is just a first step in this direction, there will ow be more companies offering better engagement with mobile OS manufacturers, hardware vendors and better products will only come out when there is more competition. Lets wait and watch how Ubuntu for Android performs in the mobile/desktop market. Leave your comments below if you more to add or have something to discuss. Nice One. I am having Samsung Galaxy S. No HDMI output. Samsung might release a docking station if this technology is successful in the market !